While two-thirds of the public supports increases to mass transit systems, just 5% of the 3 million people in San Diego County use it to commute. We feel that this disparity can be lessoned through the smart application of data driven systems such as the one we have built. By analyzing simulated onboarding/offboarding data we have demonstrated that it is possible to identify routes and times that consistently demonstrate the need for increased capacity. Rather than the traditional solution of adding more busses, we have opted for the cheaper, greener, and ultimately better solution of utilizing existing infrastructure to tackle this problem. A partnership with Lyft or Uber to create Lyft Lines or Uber pools at these bottleneck points of congestion will serve to increase public confidence in mass transit which we think will drive higher rates of adoption. We started by looking at what drives bus usage. Two factors were bus load and peak flow. Bus load is a number we assign each bus on a route to determine how crowded or close to full capacity said bus is. If a bus reaches maximum capacity we track it until that capacity abates and refer to this period as one of peak flow. 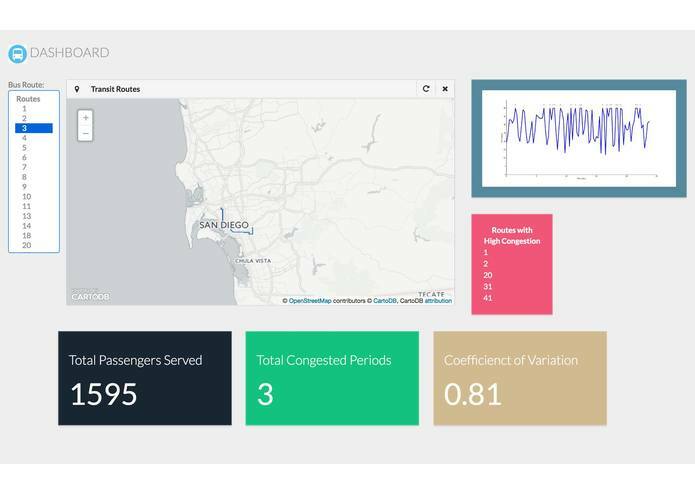 With the usage of machine learning and statistical analysis we were able to characterize bus routes by their overall usage and surge periods thus giving us actionable data that can be used to solve the problem at hand. Because the data our platform visualizes isn't public yet, we were faced with the challenge of producing a realistic simulation of these data. This was achieved by creating a neuroscience-inspired computational model of bus usage that varied in demand, surge number, surge time, and noise. Furthermore, metrics had to be developed that could accurately quantify these features in the data. The metrics we developed could accurately characterize the features of bus usage that are most relevant to improving our transit system. What we are most proud is the fact that we were able to delve into the data but also bring out actionable insights that can be clearly shown on a dashboard that requires no training in data science to view. This is one of the hardest parts of any STEM project because we know everyone has a different background and is not necessarily as technically versed as our data scientist. We learned that a lot can be done in two days given the right toolset and enough data. We think that there are a lot of unique solutions waiting in the shadows and we hope to get more opportunities to see what can be built and where it goes. In the future, we hope that the visualizations we have created will serve as a useful tool for the MTS future data collections. We hope that the MTS agrees to let us use the data from their onboarding/offboarding sensors in a pilot study to showcase the effectiveness of our model in detecting inefficiencies. Once we have amassed enough data to make statistically significant conclusions we would then love to approach ride sharing companies with the city's blessing and form a mutually beneficial partnership to help alleviate the issue of overcapacity on MTS lines. We recognize that San Diego is a great test bed for this project but we are also confident that our model could be used for any major city looking to boost its mass transit system.